*ORGANIC CHOCOLATE LIQUOR, *ORGANIC RAW CANE SUGAR, *ORGANIC COCOA BUTTER, *ORGANIC COCOA POWDER. 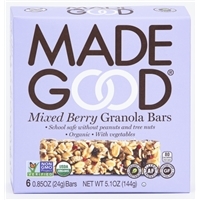 Brand/Manufacturer: Made Good RIVERSIDE NATURAL FOODS LTD. 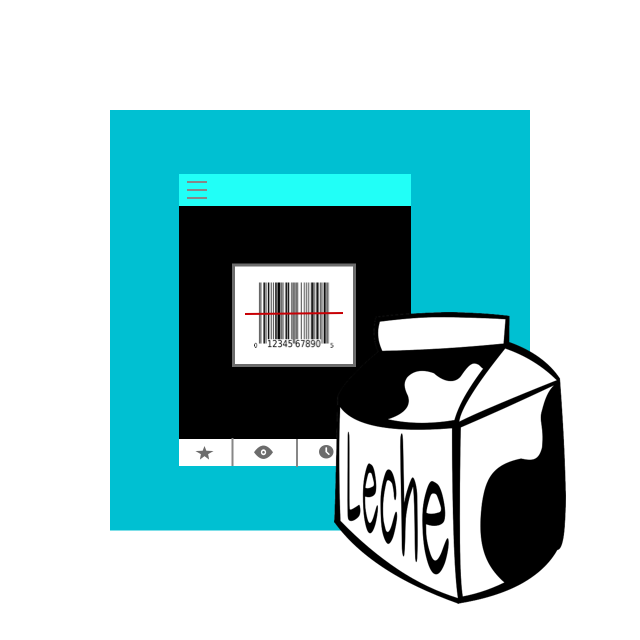 Milk chocolate (sugar, cocoa butter, chocolate, nonfat milk, milk fat, lactose, soy lecithin, pgpr, emulsifier), peanuts, sugar, dextrose, salt, tbhq (preservatives). PURE ROLLED OATS*, AGAVE NECTAR*, RAISINS*, BROWN RICE SYRUP*, CRANBERRIES*, SUNFLOWER OIL*, WHOLE GRAIN CRISP BROWN RICE*, AGAVE INULIN*, MOLASSES*, BLUEBERRIES*, RASPBERRIES*, VEGETABLE POWDER (SPINACH, BROCCOLI, CARROTS, TOMATOES, BEETS, SHIITAKE MUSHROOMS), RASPBERRY FLAVOUR*, APPLE JUICE CONCENTRATE*. 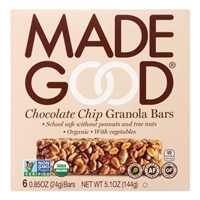 GLUTEN FREE OATS*, AGAVE NECTAR*, BROWN RICE SYRUP*, BANANAS*, CHOCOLATE CHIPS* (CANE SUGAR*, COCOA LIQUOR*, COCOA BUTTER*, VANILLA*), SUNFLOWER OIL*, WHOLE GRAIN CRISP BROWN RICE*, AGAVE INULIN*, MOLASSES*, VEGETABLE POWDER (SPINACH, BROCCOLI, CARROTS, TOMATOES, BEETS, SHIITAKE MUSHROOMS), BANANA FLAVOR*. 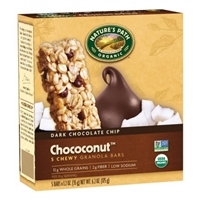 Granola (organic) (rolled oats (organic), evaporated cane juice (organic), soy oil (organic)), tapioca syrup (organic), chocolate chips (organic) (evaporated cane juice (organic), unsweetened chocolate (organic), cocoa butter (organic), soy lecithin (organic)), brown rice flour (organic), invert cane syrup (organic), dried coconut (organic), acacia gum (organic), soy oil (organic), evaporated cane juice (organic), sea salt, natural coconut flavor, molasses (organic).contains soy and tree nuts (coconut). 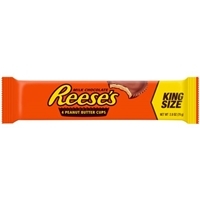 Produced in a facility that uses peanuts, wheat and dairy. 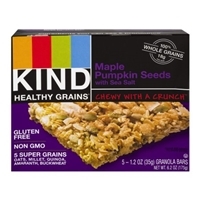 Whole grain blend (oats, brown rice, millet, oat flour, buckwheat, amaranth, quinoa), tapioca syrup, pumpkin seeds, canola oil, coconut, sunflower seeds, honey, dried cane syrup, maple syrup, brown rice syrup, gum acacia, sea salt, natural flavor, vitamin e (to maintain freshness). 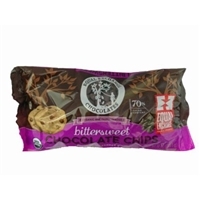 Gluten free.allergen information: contains coconut. Made in a facility that processes peanuts, tree nuts, soy and sesame seeds. 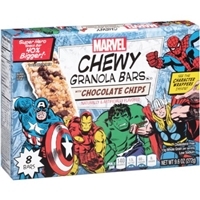 Brand/Manufacturer: Marvel Rexall Sundown, Inc.
GRANOLA (WHOLE GRAIN ROLLED OATS, WHOLE GRAIN BROWN RICE FLOUR, SUGAR, WHOLE WHEAT FLAKES, HIGH OLEIC CANOLA OIL, MOLASSES, ENRICHED WHEAT FLOUR [BLEACHED WHEAT FLOUR, MALTED BARLEY FLOUR, NIACIN, REDUCED IRON, THIAMIN MONONITRATE, RIBOFLAVIN, FOLIC ACID], CALCIUM CARBONATE, SODIUM BICARBONATE, NONFAT DRY MILK, SOY LECITHIN, CARAMEL COLOR), CORN SYRUP, SEMISWEET CHOCOLATE CHIPS (SUGAR, CHOCOLATE LIQUOR, COCOA BUTTER, SOY LECITHIN, SALT, VANILLA), WHOLE GRAIN BROWN RICE FLOUR, SUGAR, CORN SYRUP SOLIDS, GLYCERIN, DRIED COCONUT, PALM OIL, INVERT SUGAR, LESS THAN 2% OF THE FOLLOWING: CALCIUM CARBONATE, MOLASSES, SOY LECITHIN, NATURAL AND ARTIFICIAL FLAVORS, SALT, CARAMEL COLOR, CITRIC ACID, PRUNE JUICE CONCENTRATE, MIXED TOCOPHEROLS (A PRESERVATIVE). 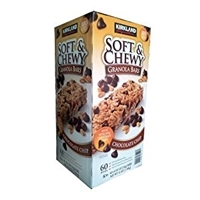 GRANOLA (WHOLE ROLLED OATS, SUGAR, RICE FLOUR, CANOLA AND/OR SOYBEAN OIL, MOLASSES, SODIUM BICARBONATE, SOY LECITHIN - AN EMULSIFIED, CALCIUM CARBONATE, SALT), CORN SYRUP, SEMISWEET CHOCOLATE CHIPS (CHOCOLATE LIQUOR, SUGAR, MILK POWDER, SOY LECITHIN - AN EMULSIFIER, VANILLA EXTRACT), CRISP RICE (RICE FLOUR, SUGAR, DRY MALT EXTRACT (CONTAINS CORN SOLIDS), SALT, CALCIUM CARBONATE), FRUCTOSE, SUGAR, CANOLA AND/OR SOYBEAN OIL, GLYCERIN, LIQUID INVERT SUGAR, DRIED UNSWEETENED COCONUT, SOY LECITHIN - AN EMULSIFIER, HONEY, SALT, WHEAT FLACKS, HONEY, SALT, MALT EXTRACT), ASCORBIC ACID, CITRIC ACID, ROSEMARY EXTRACT, NATURAL FLAVOR. 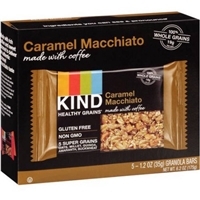 Whole Grain Blend (Oats, Brown Rice, Millet, Amaranth, Oat Flour, Buckwheat, Quinoa), Tapioca Syrup, Sugar, Dried Cane Syrup, Honey, Palm Kernel Oil, Canola Oil, Brown Rice Syrup, Gum Acacia, Natural Flavor, Coffee, Cocoa Powder, Sea Salt, Vanilla Extract, Soy Lecithin, Annatto, Vitamin E (to maintain freshness). CORN SYRUP, ROLLED OATS, SUGAR, PALM AND PALM KERNEL OILS, MILLED CORN, WHEY PROTEIN ISOLATE, SOY PROTEIN ISOLATE, GLYCERIN, CORN SYRUP SOLIDS, ALMONDS, HAZELNUTS, COCOA PROCESSED WITH ALKALI, SUNFLOWER OIL, CONTAINS 2% OR LESS OF: INVERT SUGAR, NATURAL AND ARTIFICIAL FLAVORS, SALT, CALCIUM CARBONATE, SOY LECITHIN, CANOLA OIL, TOCOPHEROLS (ANTIOXIDANT), FULLY HYDROGENATED VEGETABLE OILS (RAPESEED, COTTONSEED AND SOYBEAN), SKIM MILK, MOLASSES, HONEY, COCOA, WHEY POWDER, MALT SYRUP (BARLEY), SUNFLOWER LECITHIN. QUAKER. 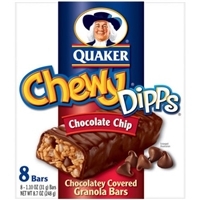 CHEWY DIPPS. CHOCOLATE CHIP. CHOCOLATEY COVERED GRANOLA BARS. 8 BARS. 8 - 1.10 OZ (31G) BARS. NET WT 8.7 OZ (248 G). 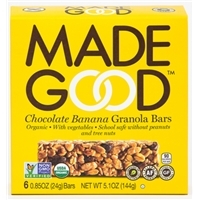 Granola (whole grain rolled oats, whole grain rolled wheat, sugar, sunflower oil, high fructose corn syrup, molasses, dried coconut, honey, sodium bicarbonate, natural flavor, whey protein concentrate), sugar, partially hydrogenated palm kernel and palm oil (adds a dietarily insignificant amount of trans fat), crisp rice (rice flour, sugar, barley malt, salt), corn syrup, semisweet chocolate chips (sugar, chocolate liquor, cocoa butter, soy lecithin, vanilla extract), high fructose corn syrup, whey, brown sugar, corn syrup solids, glycerin, lactose, partially hydrogenated soybean oil (adds a dietarily insignificant amount of trans fat), cocoa, cocoa processed with alkali, sorbitol, milkfat, salt, soy lecithin, glyceryl lacto esters of fatty acids, natural and artificial flavor, bht (preservative), citric acid.contains wheat, coconut, milk and soy ingredients. 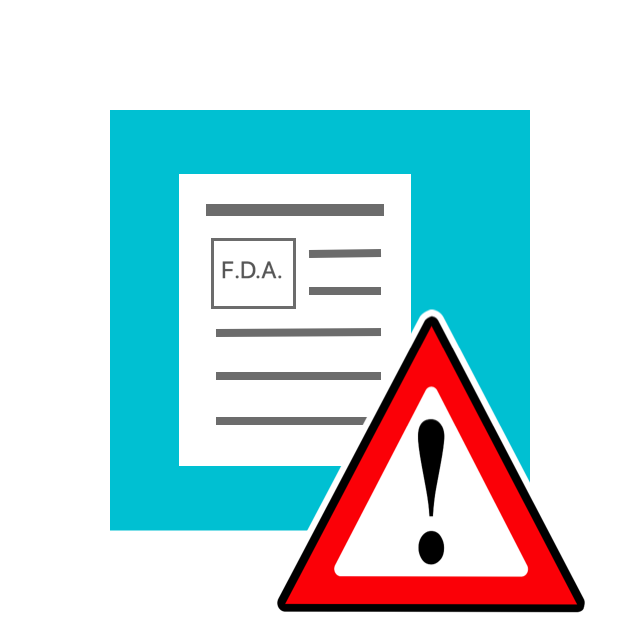 May contain traces of peanut and other tree nuts. 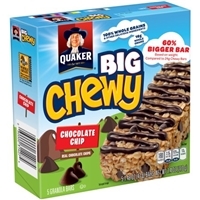 Granola (whole grain rolled oats, brown sugar, crisp rice [rice flour, sugar, salt, malted barley extract], whole grain rolled wheat, soybean oil, dried coconut, whole wheat flour, sodium bicarbonate, soy lecithin, caramel color, nonfat dry milk), corn syrup, semisweet chocolate chips (sugar, chocolate liquor, cocoa butter, soy lecithin, vanilla extract), brown rice crisp (whole grain brown rice, sugar, malted barley flour, salt), sunflower oil, corn syrup solids, oligofructose, polydextrose, glycerin, contains 2% or less of: water, calcium carbonate, invert sugar, salt, diacetyl tartaric acid ester of mono-diglycerides, molasses, sucralose, natural and artificial flavor, bht (preservative), citric acid.contains soy, wheat, coconut and milk ingredients. May contain traces of peanut and other tree nuts. 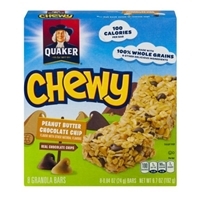 Granola (whole grain rolled oats, brown sugar, crisp rice [rice flour, sugar, salt, malted barley extract], whole grain rolled wheat, soybean oil, whole wheat flour, sodium bicarbonate, soy lecithin, caramel color, nonfat dry milk), corn syrup, semisweet chocolate chips (sugar, chocolate liquor, cocoa butter, soy lecithin, vanilla extract), peanut butter spread (peanuts, sugar, palm oil, salt), brown rice crisp (whole grain brown rice, sugar, malted barley flour, salt), peanut flavored chips (sugar, palm kernel and palm oil, partially defatted peanut flour, lactose, dry whey, dextrose, corn syrup solids, soy lecithin, salt, vanillin [artificial flavor]), invert sugar, corn syrup solids, glycerin, contains 2% or less of calcium carbonate, sorbitol, salt, water, natural and artificial flavor, bht (preservative), citric acid.contains wheat, soy, peanut and milk ingredients. May contain traces of tree nuts. 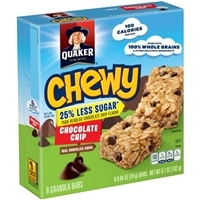 Granola (whole grain rolled oats, brown sugar, crisp rice [rice flour, sugar, salt, malted barley extract], whole grain rolled wheat, soybean oil, dried coconut, whole wheat flour, sodium bicarbonate, soy lecithin, caramel color, nonfat dry milk), semisweet chocolate chips (sugar, chocolate liquor, cocoa butter, soy lecithin, vanilla extract), corn syrup, sugar, brown rice crisp (whole grain brown rice, sugar, malted barley flour, salt), invert sugar, corn syrup solids, glycerin, soybean oil, vegetable oil (palm oil, palm kernel oil). 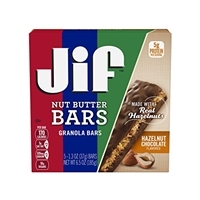 Contains 2% or less of sorbitol, calcium carbonate, cocoa powder (processed with alkali), salt, cocoa powder, water, whey, nonfat dry milk, lactose, soy lecithin, molasses, natural and artificial flavor, vanilla extract, bht (preservative), citric acid.contains wheat, coconut, soy and milk ingredients. May contain traces of peanut and other tree nuts.